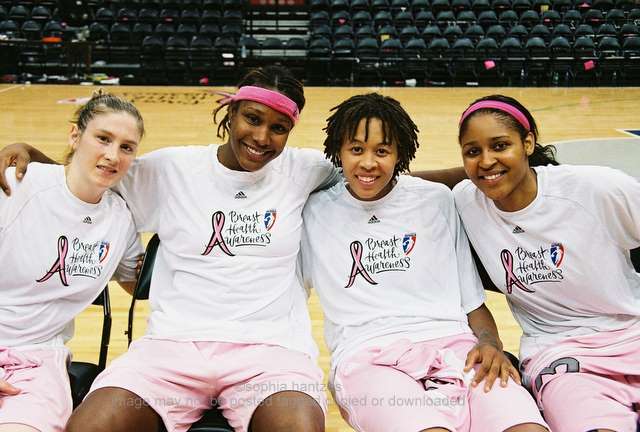 Whalen, Brunson, Augustus, and Moore of the Minnesota Lynx. USA Basketball has announced that Lynx players Seimone Augustus, Rebekkah Brunson, Maya Moore and Lindsay Whalen are among 21 finalists for the 2012 USA Women’s Olympic Team. A gold medal winner in 2008, Augustus (6-1, guard/forward) is looking to play in the Olympics for the second time in her career. She appeared in all eight games off the bench in 2008, averaging 7.9 points and 2.3 rebounds per game. Brunson (6-2, forward) appeared with Team USA in the 2007 FIBA Americas Championship and 2003 Pan American Games. Her performance in 2007 helped Team USA qualify for the 2008 Olympics in Beijing, averaging 9.0 points and 3.6 rebounds per contest as the US went unbeaten. Moore (6-0, forward) is looking to make the final roster after helping the US qualify for the Olympics during the 2010 FIBA World Championship. She appeared in all nine games, averaging 8.7 points and 3.3 rebounds in 18.3 minutes per contest as the USA went unbeaten to secure their spot in London. Whalen (5-9, guard) was also a member of the unbeaten 2010 FIBA World Championship team that avenged their 2006 bronze medal. She averaged 5.9 points, 2.1 rebounds and 1.6 assists in 18.4 minutes off the bench, including scoring a team-high 16 points in their second round victory over Canada. Team USA is seeking its fifth consecutive and seventh overall gold medal, as well as extending its 33-game Olympic winning streak. The 2012 Olympic basketball tournament will be held from July 28 to August 12 in the Olympic Park Basketball Arena (preliminary round and quarterfinals) and North Greenwich Arena (semifinals and finals).